This month for French Fridays with Dorie, we are doing something a little different. We voted for our four November recipes (I have almost stopped pouting about the fact that only half my choices made the cut), but we can prepare them in any order that we choose. This week I chose the Roast Chicken for les Paresseux. After last weekend's candy and cupcake filled Halloween festivities, I wanted something a little more earnest, so a roast chicken fit the bill perfectly. I made a slight miscalculation, however, because I was not anticipating the deliciousness of a white wine and chicken dripping-laced pan sauce, or the irresistibility of sopping it up with chunks of crusty bread. Les paresseux, Dorie tells us, are the lazy people. 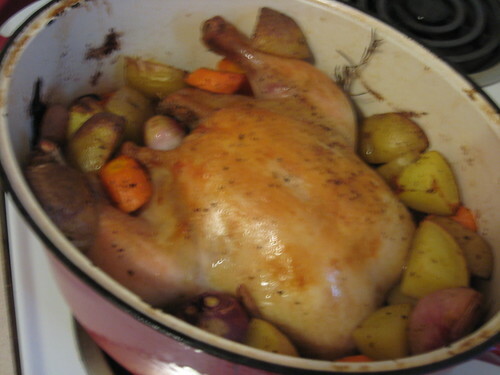 While I am not the type to shy away from labor intensive recipes (see croissants and the mysterious thing I want to tell you about this week - I know, I am a tease), I think that it is important to have a repertoire of easy recipes, especially ones that are as delicious and impressive as this roast chicken. This dish would be wonderful for a small dinner party because it makes a beautiful presentation with a minimum of stress. 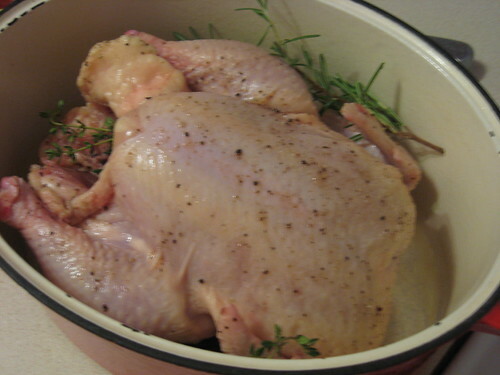 Basically, you season your chicken, toss it into a pot with some aromatics and white wine, and pop it in a hot oven. After a while you add some chunked root vegetables, and you will have a fuss-proof side dish to go with your perfectly juicy chicken. Steam some green beans or toss a salad while the chicken is resting, and you have a luscious meal that still feels earnest. Of course, if it feels a bit too earnest, you can always use your free time while the chicken is cooking to make dessert. For this roast chicken recipe, and many more fantastic French dishes, pick up a copy of Around my French Table. Head over to the FFwD site to see which dish everyone else chose to make this week. Debating between this and the Gratin for next week. Maybe I should make both for dinner one night? :) Yours looks lovely! Looks very appealing. You have made me hungry - I had better go and get something to eat. Looks wonderful I think I should have tried this instead of the Semolina cake! Thanks for the compliments, ladies! I am thinking about making roast chicken a feature. Maybe next week I will do the gratin and another chicken, too. I know my boyfriend won't mind. Sarah: At least you have this to look forward to. The cake seems to be the divisive recipe from what I have read. I am still intrigued, though! Sounds earnest, but turns out to be decadent, I found! I bet yours was delicious - it browned beautifully! This looks delicious and looks so easy. Glad this came out so beautifully for you!